The church marks time with a liturgical calendar that begins with Advent and continues with Epiphany, Lent, Easter, Pentecost Day and the Season after Pentecost. 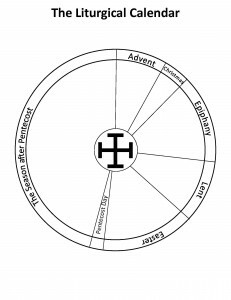 Below illustrates the liturgical seasons as a calendar wheel. We are currently in the liturgical season of Advent, a time of preparing to receive God’s love anew and remember the birth of God’s son, Jesus, who came to live among us.